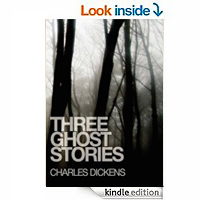 Three classic ghost stories by Charles Dickens. Includes the following stories: The Signal-Man, The Haunted House, The Trial for Murder. 'The Signal Man' is more a tale of the uncanny than a horror story, with the supernatural elements underplayed and their import very much left to the reader to work out. In "The Haunted House" the narrative wanders and takes us into a nocturnal dream world that is the writer's childhood, and just when you think he has lost the plot you find that he has taken you to what is actually haunting, yet real. The ghost in this short story is that of a murdered man who appears to the Foreman of the Jury at the trial of his assassin. What is uncanny is that the Foreman had previously seen the apparition twice before being summoned for jury service: the first time pursuing his killer down the street outside the Foreman's house, the second time beckoning within his house on the eve of the jury summons.